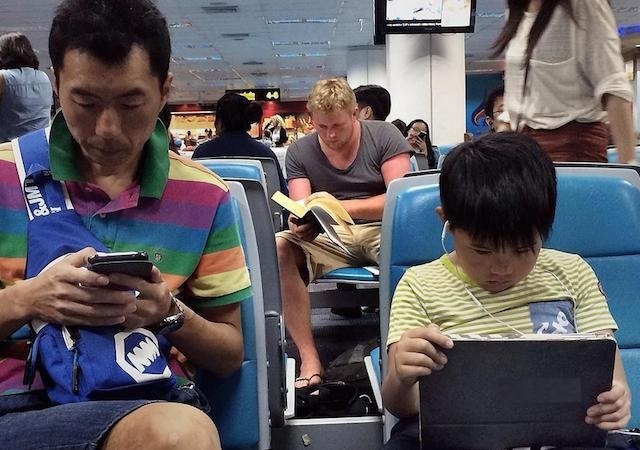 A post on the Shanghaiist website this week of a collection of images similar to the one at the top of this article claimed to portray the difference between Chinese and Western tourists in the departure lounge of Bangkok airport. The Chinese tourists were all glued to their mobile devices whilst their Western counterparts read or chatted to each other. 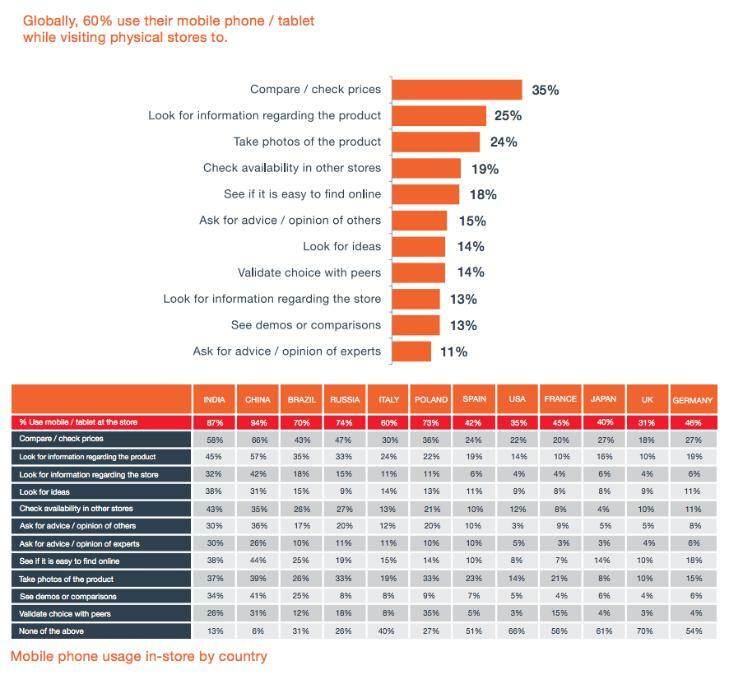 Whilst this particular case may be purely anecdotal, data from studies such as ‘Connected Shopper’ by Geometry Global provide a deeper insight into how and when usage of mobile devices differs between East and West. Looking at how mobile devices are used in retail on a global scale, 94% of Chinese users are using their mobiles at point of sale – compared to around 30% in the USA and UK. Take a moment to consider that figure – with 520 million people on mobile devices in China, 94% of that is around 495 million people, all browsing for various purposes such as looking up product info, checking and comparing prices and authenticity, and validating their choice with friends to name but a few. With this in mind, and considering both the similarities and disparities in mobile usage at points of sale on a global basis, any omni-channel retail services need to be culturally relevant and specifically cater to the country in question on both a transactional and experiential level. In the case of China, this means taking into account all behavioral and technological factors to provide a seamless shopping experience to empower the Chinese consumer with the information they need at the time they need it and provide them with the means of purchase most convenient to them. If the Chinese consumer in question just so happens to be walking around the store with their head bowed, eyes focused on their mobile phone screen, then this is the means through which you need reach them. Using mobile phones for payment is a concept already widely recognized in both the East and West, with Apple rolling out their Apple Pay service in the USA earlier this week, and e-commerce giant Alibaba’s Alipay already claiming 190 million monthly average users with its services widely available in retailers across China. However, use of mobiles as part of the offline retail experience is only just starting to receive the attention it fully deserves – in the West, mention the word ‘iBeacon’ to most people and the non-techies will shake their heads and scratch their chins. In China, where QR codes are already widely accepted as portals for both payment and information, the situation is slightly better, with several brands starting to use QR code technology to link personal mobiles to the in-store experience – a function that has been aided by WeChat’s decision to offer implementation of a QR code scanner into individual brand accounts. China has many nuances that need to be taken into consideration when developing a seamless retail experience, including device usage, search engine and e-commerce landscape, social landscape and sharing behavior, available technology and consumer preference. Using the earlier example of iBeacon, it may be gaining traction in the West, but you’d need to ask yourself if and how it should be done in a market where Wechat and QR codes are already so engrained in the retail environment. You’d also need to check platform compatibility – as the customary ‘i’ prefix suggests, ‘iBeacon’ may have been introduced by Apple last year, but limiting functionality to interact only with iOS in a heavily Android market is setting yourself up for failure. You’d also have to consider privacy issues – whilst Mary Meeker’s most recent presentation on internet trends has shown that Chinese users are more willing to test new technology than users from other countries, recent scandals such as Apple’s iCloud leak mean that there is also concern for privacy and personal data. Brands like H&M have realized this, and are using an ‘opt in’ approach in many of their stores, so when you log into their free in-store WiFi you agree to give them access to certain data whilst you’re shopping. Investing in this seamless experience can have multiple benefits for brands. First, having relevant information available quickly and efficiently, such as having product details in a concise mobile format, can increase conversion by ‘shrinking’ the information search process for the consumer and allow companies to focus on key styles and flagship products. Second, it provides access to detailed and valuable analytics about the consumer journey before final purchase, including what displays the consumer has visited, how long they spent in store, and what products they looked at. Third, using technology and key social platforms to socialize the in-store experience by giving access to social data such as ‘likes’ and ‘comments’ about certain products means consumers can become an advocate of your brand and help drive increased awareness and conversion through pictures, comments and reviews. In terms of an omni-channel strategy for China, when looking at where the China retail experience is heading and how it fits to your brand, your strategy should be tailored, tried and tested on a small scale, and then rolled out on a larger scale once you have solid data to back up your original hypotheses.